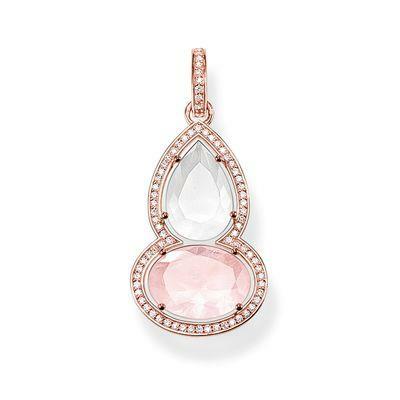 This beautiful pendant from the Beauty of Maharani collection from Thomas Sabo features a unique double pendant crafted in 925 Sterling Silver with 18ct Rose Gold plating. A teardrop Milky Quartz stone is perfectly cut with an oval Rose Quartz stone and outlined with glistening White Cubic Zirconia. The eyelet clasp is further detailed with sparkling stones for an eye-catching piece to add to your Thomas Sabo chain.